Laos kicks off the S.E. Asian One Belt, One Road (OBOR). I prefer the historical term of the new “Silk Road” to describe the modern trade routes linking China with the rest of the world. 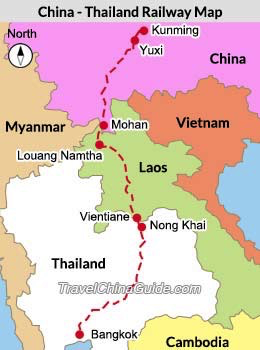 The new, high speed rail line from China to the capital of Laos in Vientiane will certainly provide a silky-smooth 160 km/hour ride through the mountains and valleys of northern Laos with an efficient flat track being facilitated by 63% of the 414 km line constructed of tunnels and bridges. While similar plans to connect China to Myanmar, Thailand and Vietnam are stalled for political, economic and ideological reasons, it appears that Laos has concluded that there is more to gain than to lose by agreeing to participate with this first step in a much grander plan to link all of S. E. Asia to the Chinese railway network. The rail line from Mohan (Chinese side) to the Lao capital at Vientiane is actually under construction while the onward connection to Bangkok is still being negotiated. The new line enters Laos at the northern border town of Boten with stations at Luang Namtha, Luang Prabang and Vang Vieng on the way to Vientiane. Construction is in the very early stages but has commenced in a number of locations at once with the 5 year completion time appearing to be a real possibility. Official reports state that the funding for the US$5.8 Billion line is shared with 70% from the Chinese side and a 30% contribution from the Laos government. 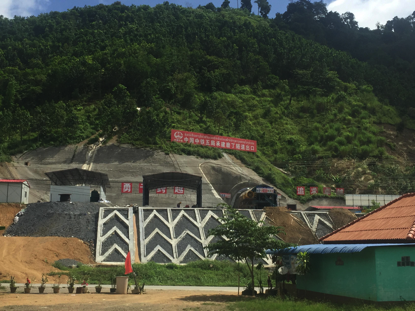 Photo : the exit of the first tunnel from the Chinese border gate heading south towards Luang Namtha. 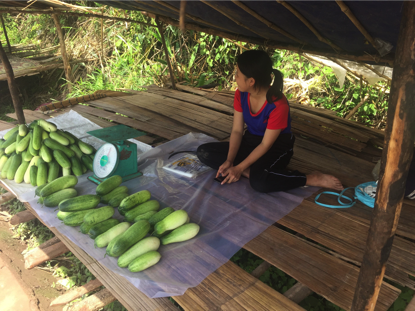 Photo : a small farmer’s stall on the road through the jungle connecting Luang Namtha with the Boten-China border gate. This remote jungle area has excellent 3G connectivity. I visited Laos in June and travelled to the Boten-Mohan, Laos-China border gate to see for myself the progress of the project. While the actual rail line construction has only just begun, the preparations in terms of a massive influx of personnel, construction materials and equipment coming through from China is already having a significant impact on the economies of the small towns along the rail line route. One very obvious early benefit to the local community was the excellent 3G digital signal along the jungle roads of the Luang Namtha district. The photo above shows a young girl selling zucchinis on the side of the road in the middle of nowhere but close to the future route of the rail line. She has a smart phone that allows her to connect to her family back on the farm to send more product or to tell them to come and pick her up. She can also connect to her friends (I will bet she is on Facebook) and help fill in the boring gaps in activity while waiting for the next car, truck or motorbike carrying potential customers to pass by. Laos is the only land-locked country in South East Asia so this modern rail link provides much greater potential opportunities than it does to the other SE Asian nations who are still considering and negotiating their participation in China’s grand silk road, OBOR plan. The Laotian cattle herd is quite modest in size and importance at roughly 1 million head. The local cattle are very small in stature with mature cows weighing around 300 kg or less so the beef industry plays only a very minor role in the Lao agricultural sector. Draft power is now supplied by diesel powered hand tractors in most rural areas. 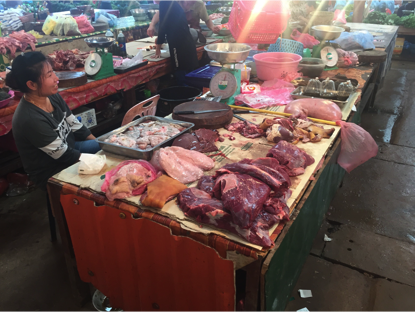 I thought that I had seen everything in terms of wet market beef cattle presentations but the Laotian butchers provided some unique offerings which gives them the Gold Medal when it comes to the full utilization of the beef animal. 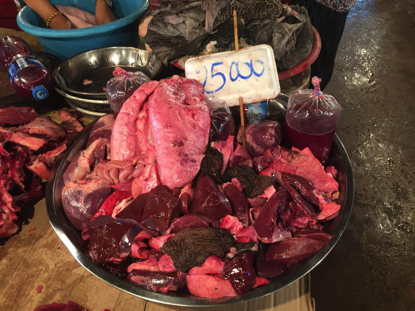 The photo below shows a wet market stall selling gastro-intestinal fluids which is definitely a first for me while almost every beef table in the markets that I visited offered at least one pregnant uterus. Photo : Vientiane wet market stall with cattle gastro-intestinal fluids as their main offering. Photo : another beef table with mainly offals including a pregnant uterus (top right) and two udders (bottom left). I was extremely fortunate to stay with Mike and Xoukiet Boddington at their beautiful “Jungle House” homestay in Vientiane. 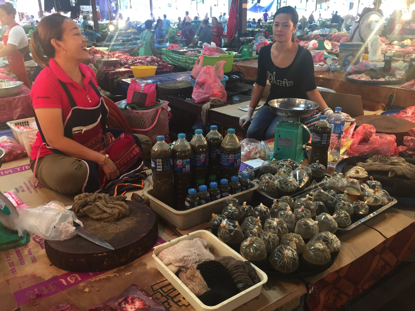 After visiting the wet markets with Mike, Xoukiet who is a fine cook, was able to explain about the gastro-intestinal fluids and the pregnant uterus which are regarded as local delicacies. She explained that the gut liquids are used to produce a marinating sauce (plus a large number of herbs and spices etc.) which Mike confirmed is quite delicious. Xoukiet also told us that her father was very fond of a traditional Laotian dish prepared from a uterus and foetus and that it was still a favourite among many of the older generation of local beef consumers today. Forgive me, but I didn’t enquire about the details. If all the other wet markets in the country have a similar number of pregnant uteri on their tables then the national herd might well be in serious danger of further decline. Some tables in the larger markets also offered frozen beef, pork and chicken imported from Thailand. Fresh Lao beef was selling for Kip 70,000 per kg while the frozen Thai (CP) beef was priced at Kip50,000. One AUD is currently worth Kip 6,350 so the fresh local product is worth about AUD$11 per kg while the frozen Thai beef is around AUD$7.87. As you can see from the photos below the mixed offals sell for Kip25,000 per kg or about AUD$3.94. Udder costs Kip60,000 while a pregnant uterus will set you back Kip30,000 or about AUD$4.70 per kg. Frozen broiler chicken and pork from Thailand also sells for Kip25,000. Local farmers chickens were selling for Kip40,000 or AUD$6.30 per kg. 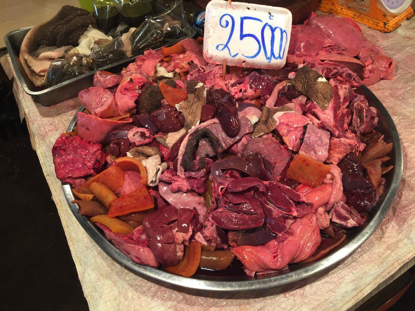 Photo : every single beef stall in the markets includes a prominent tray of mixed offal while no stall was without at least one pregnant uterus on display. 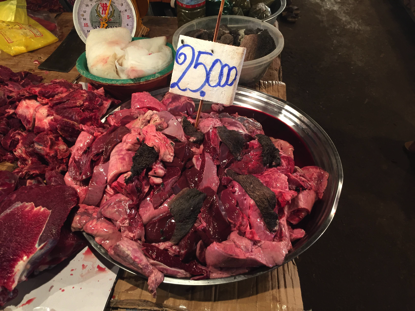 Photo : too much beef offal is still never enough for Laotian beef consumers. If anyone is travelling to Vientiane in the future and needs accommodation, I cannot recommend Mike and Xoukiet’s Jungle House highly enough. 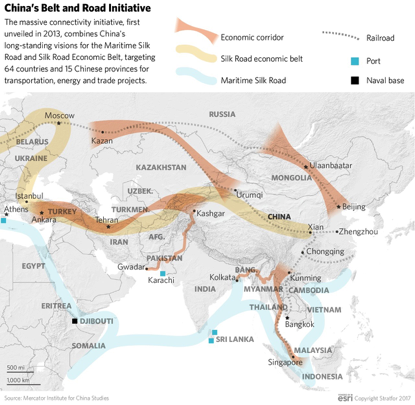 The Big Picture of the OBOR. I wonder where the more ‘regular’ cuts (rumps, loins…) are sold, for how much and who eats it.